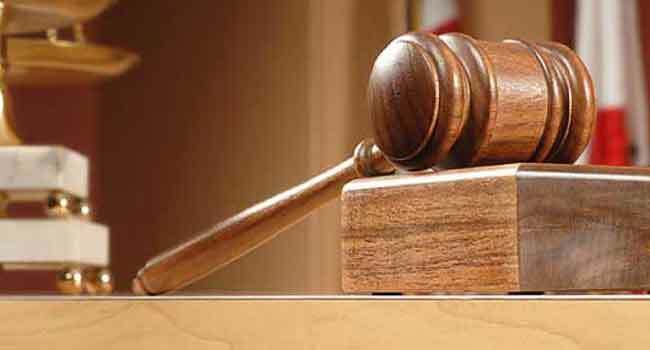 A Federal High Court sitting in Jalingo, the Taraba State capital has asked the EFCC to produce the governorship candidate of the All Progressive Congress (APC) in the state, Sani Danladi, for trial on allegations of money laundering and conspiracy. This was as a result of the inability of the Economic and Financial Crimes Commission (EFCC) to serve the APC candidate summons as held on October 23. The trial judge, Justice Stephen Pam, issued another order to produce the third defendant as the court proceedings were stalled today. The first and second defendants in the case are former Minister for Labour and Productivity, Senator Joel Ikenya, and former Speaker of Taraba State House of Assembly, Mark Useni. Danladi, who is also a former deputy governor and acting governor of Taraba, and the two others are being charged with two counts of conspiracy and violation of financial regulations. They were accused of collecting the sum of N450 million from former President Goodluck Jonathan in the build-up to the 2015 general elections. Counsel to the EFCC, Israel Akande, asked Justice Pam to give the anti-graft agency more time to serve summons to the APC governorship candidate to appear before the court for the continuation of the case. But counsels to the first and second defendants, Effiong Ibrahim and Festus Idegbefor argued that the three defendants were on facing the same charges. They added that the inability of the EFCC to produce the third defendant was same as holding their clients to ransom. They, thereafter, prayed the court to discharge the first and second defendants pending when the EFCC was ready. After listening to the arguments of both parties, the trial judge adjourned the case till January 15, 2019, for further hearing. Outside the court premises, a group known as Amalgamated Youths protested the inability of the EFCC to produce the third defendant. The protesters accused the agency of shielding Danladi because he was contesting the election on the platform of the ruling party.